Trump Organization Settles Lawsuit With Chef José Andrés : The Two-Way The two-year legal battle concerned a restaurant in Trump's Washington, D.C., hotel. Andrés pulled out of the deal in 2015 after Trump made comments disparaging Mexicans. The Trump Organization and celebrity chef José Andrés announced a settlement on Friday in the two-year legal dispute over a flagship restaurant in Trump's Washington, D.C. hotel. Above, the Old Post Office building in July 2015 under renovation before the hotel's opening. The Trump Organization has settled a legal battle with the chef José Andrés that had stretched on for two years. The lawsuit concerned a restaurant deal that Andrés pulled out of after Trump made comments disparaging Mexicans. Andrés' restaurant was to be in the Trump International Hotel in Washington, D.C., which operates inside the historic Old Post Office. Terms of the deal were not disclosed, and both parties declined comment beyond a joint statement from the Trump Organization and Andrés' restaurant group, Think Food Group. "I am glad that we are able to put this matter behind us and move forward as friends," Donald Trump Jr. said in the statement. "Since opening in September 2016, Trump International Hotel, Washington, D.C. has been an incredible success and our entire team has great respect for the accomplishments of both José and TFG. Without question, this is a 'win-win' for both of our companies." "I am pleased that we were able to resolve our differences and move forward cooperatively, as friends," said Andrés in the statement. "I have great respect for the Trump Organization's commitment to excellence in redeveloping the Old Post Office. ... Going forward, we are excited about the prospects of working together with the Trump Organization on a variety of programs to benefit the community." The Washington Post reports that Andrés had already planned a menu for the restaurant, which was to be called Topo Atrio, and that in the spring of 2015, "Andrés and Trump's daughter Ivanka traded design ideas and advanced plans for the restaurant." But those plans fell apart in 2015, after Donald Trump made disparaging comments about Mexicans, calling them "rapists" and saying that they were bringing drugs and crime into the U.S. Andrés pulled out of the deal, and Trump sued for $10 million in a breach of contract suit. "The perception that Mr. Trump's statements were anti-Hispanic made it very difficult to recruit appropriate staff for a Hispanic restaurant, to attract the requisite number of Hispanic food patrons for a profitable enterprise, and to raise capital for what was now an extraordinarily risky Spanish restaurant." A few weeks before taking office in January, Trump sat for a videotaped deposition in the suit. The General Services Administration said last month that the Trump Organizations is in "full compliance" with a lease that specifically says no "elected official of the Government of the United States ... shall be admitted to any share or part of this Lease, or to any benefit that may arise therefrom[.]" That decision has been questioned by many ethics and contract experts. 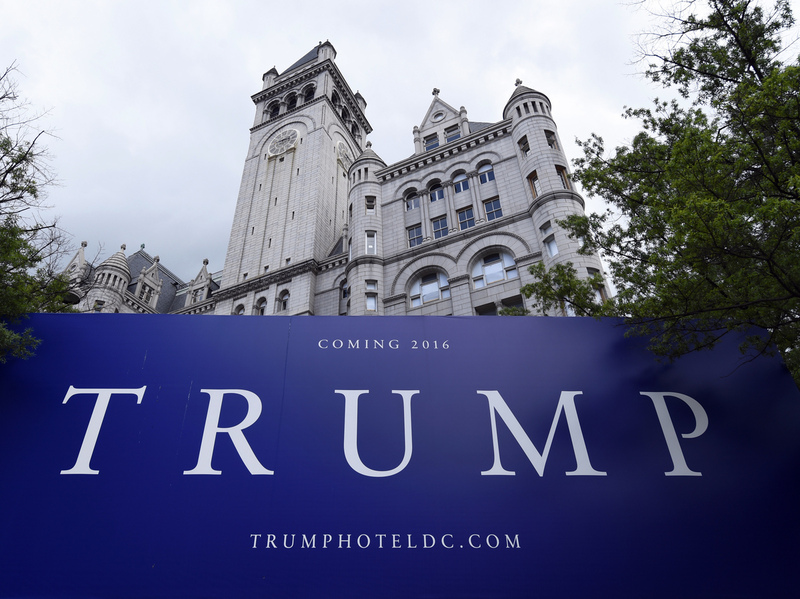 The Trump Organization is reportedly looking to open a second hotel in Washington.